It's that time of year again for the 7th annual Florida Bowlriders Cup March 15-17, 2013. 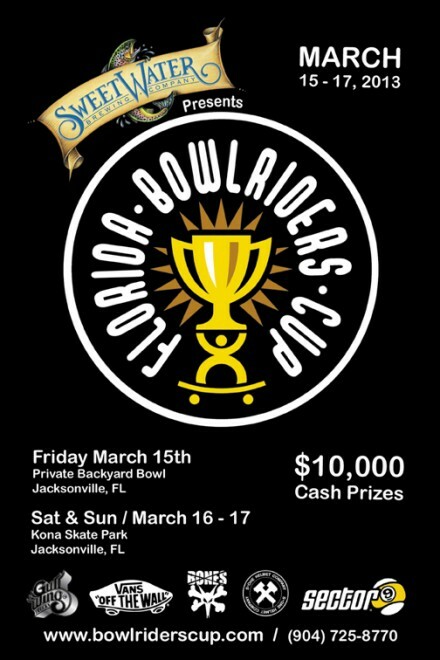 Florida Bowlriders Cup brings together one-hundred of the worlds top amateur and professional skateboarders. Established in 2007, it is the ultimate in grassroots competition. It brings Pro's, Masters, Women and Amateurs together over a multi-event weekend. Points are accumulated from two different venues, over a three-day span, to crown a yearly champion. Participants may take advantage of the Kona Campgrounds and all the extra's and side events that happen throughout the weekend. Its an experience of a lifetime for both competitors, spectators and families. Entries are on a first come first serve basis. There are 10 spots for the women’s division.